At the tail end of May, 2015, I journeyed to Chaco Canyon for three days. I hadn't been in about 25 years. I used to go every summer as a stop over on road trips to and from Santa Fe from Santa Barbara in the late 1980’s. Far too long a time had lapsed since I'd been there. Far too long. I didn't realize how much I missed going until I was on the dirt road heading into the canyon with dust clouds kicking up behind the truck in basically the middle of Navajo Res Nowhere, New Mexico. The road had changed – although still washboard dirt. It wound in and out of arroyos passing a few scattered feeder lanes ending in old hogans out in the distance. Even though the route was different – the crossing back in time was the same. My traveling companion was Jamie Hamilton – a brilliant young sculptor, draftsman, aerialist, climber, yogi, creative thinker and great friend. He’d not been to Chaco. We were caravanning there with Daniel Milnor and Amy Kawadler – also close friends who’d not been to Chaco either. Nor had they met Jamie. Daniel is another one of those rare elite creative minds, a yogi too, a “former” photographer who makes books – lots of them – an outside the box thinker and Photographer at Large for the online publishing company, Blurb Books. Amy is a photographer also: a go getter, a social force to be reckoned with, who happens to manage the Canon Professional Services center in Hollywood. I'm convinced she knows everyone who's anyone in Los Angeles working in still and motion photography using Canon cameras – and multitudes of other people that use different cameras in different cities too. Daniel and Amy were a tad more conservative in negotiating the washboard road than my usual tactic. I go fast. Jamie and I reached the paved section leading into the park and I noticed a few things – no Daniel and Amy behind us and how green green green the landscape was. And elk grazing! 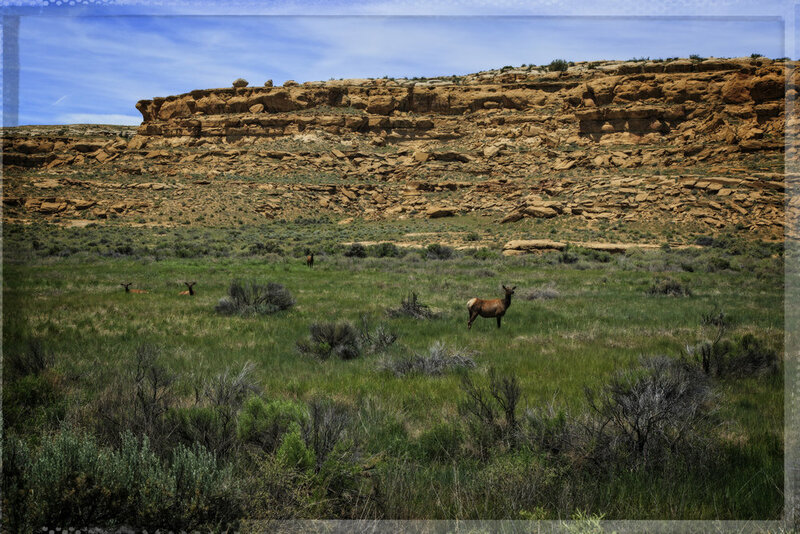 The many times I’ve been to this canyon, I’d never seen so much vegetation – and certainly no large animals. Dead cows along the road, yes. Elk? Never. Our cautious comrades eventually showed – not too far behind. Daniel and Amy invited another couple along on the trip – Dan and Kathryn Winters. I could go on and on and on about this couple… suffice it to say that even though I was meeting them for the first time I was well aware of Dan’s reputation in the field of photographic portraiture. He’s as good as it gets. But I had no idea the immense breadth of his oeuvre and talent, his knowledge and ability to discuss most any subject conceivable and the varied disciplines the man practices from celebrity uber portraits to model making for films – and so damn much more in between. Genius! Kathryn left a highly success career in television and film production to manage Dan’s career and studio. She makes certain it all happens. Both have keen intellects, witty and clever, with feet firmly planted on the earth, willingly able to impart and share their experience and knowledge. Introductions were made after camps were set up in our respective spots. New friends. Old friends. Connections. One never knows how this kind of thing will go. Core people have an idea for an adventure, then invite others along thinking, hoping, trusting, everyone will get along? Can be awkward. It wasn’t. There are few people one meets who are able to access their intellectual capabilities – their wit, inventiveness, differences, visions and their hands – to actually translate and finesse those aptitudes into a creative output that transcends being just clever, smart or a beautiful novelty. Rare. I found myself surrounded by five people who could do exactly that. Real artists. So here we are camping in Chaco Canyon for a few days – a creative sextuplet – six individual voices out to explore and discover the very palpable magic of this ancient place. Everyone is a Chaco experience virgin except me. Amy and I organized this pilgrimage, if you will, having no idea if the trip would be a magnificently inspired escapade or an utter debacle. What the hell? If you don’t reach out in an attempt to share what you have seen, felt and discovered in remarkable places, then you will never have the opportunity to expand those discoveries into unconsidered and divergent realms. Dilate. Surveying the people I know in the broad spectrum of the “art” world, those who are friends, those with whom I hang - most all would get on. Thriving in the dialogue. Common trait – lack of a burdensome ego. We brought cameras (of all kinds), a few props (Amy was continuing a photographic project she began years ago), watercolors, notebooks, journals, bicycles and the willingness to see and investigate a place unlike any other on the planet. Six pairs of eyes with unique vision, six different ways of thinking, processing and communicating and six very open people ready for a casual exploration, contact and the ever important – fun. Possibly enlightenment? Oh, and food and drink galore. Tent glamping. There really were no expectations for grand revelations – only a willingness to wander these crumbling but stabilized Anasazi ruins, take pictures, do some drawing and watercolors, hike to outliers and introduce old and new friends to ancient places. Whatever we each discovered, learned, experienced or questioned was shared as we went about doing exactly what we set out to do - traversing the trails, making pictures, painting, eating around the campfire or celebrating a birthday (Kathryn's). Generally with lively, intellectual and/or hilarious discussions – but sometimes without having to speak a word. We had a very loose structure, if one could call it that, and we all made treks to the various sites in the canyon – some planned and some spontaneous and improvised. Some moderately illegal. We were harassed by a ranger for being in a ruin after sunset. We just couldn’t leave. One more shot. He was not happy. Nor was he a happy person. We went off in groups or alone. No pressure. No format. No hassles – except for the grumpy ranger. The photographs in this book are a record of the few days we spent in Chaco – and a short narrative of my time in the canyon, on the mesas and wandering the ruins with five exceptional people. As many times as I have been to Chaco Canyon, technically Chaco Culture National Historical Park, I had never brought watercolors and paper along to do plein air painting. (I hate the word “Historical” by the way. Why can’t it just be “Historic?”) I have brought cameras plenty of times – and was even able to get permission to shoot inside the great kiva at Casa Rinconada on a full moon at midnight many years ago. The ironic thing about that late night encounter: after all the calls, letters, planning and permits, the minute I was in the kiva and started shooting, the click of the camera echoed so incredibly loud that I felt as if I was the cause of some jarring violation. I stopped after just a few shots. Odd. Now you can’t even access the inside of the kiva – at all. I've built mud and rock miniature cliff dwellings in the cliffs above Gallo campground (you are not supposed to venture up there anymore either), but I had never spent any time doing watercolors on site. The first morning there I did a few watercolors in the campground. Warming up. In the afternoon, after a long hike to an outlier ruin where I did a bit more painting, I rode my bike to a ramada covered picnic area off the road in the center of the canyon with a perfect view of Fajada Butte – the massive sandstone butte rising 135 meters up from the canyon floor. I got out my watercolors and camera and I painted and took pictures for hours. I watched and recorded the shifting light, migrating shadows, dynamic clouds, colors transforming and undulating atmosphere surrounding this enigmatic natural monument. A profound presence in the valley floor. The weather was perfect – huge cumulus clouds rolling in dropping a bit of rain. Then a clearing. I stayed and worked until dusk. Until I couldn't see any longer. Thankfully, no ranger scolding me this time. I have been transfixed with Fajada Butte over the years – in fact I did a series of monotypes and paintings in the late 1980’s of the butte when I was going there often. There have been a number of discoveries on the butte itself – small cliff dwellings, a lunar and solar calendar/marker of equinoxes and solstices and the ruins of a massive earthen ramp that provided access to the higher parts of the butte. Mysterious and debated evidence. The early pueblo people who inhabited the area in the 8th to 13th centuries clearly had a precise awareness of and reliance on astronomical phenomena relating to the seasons. They had to. And they celebrated those occurrences. Hunter gatherers with early agriculture. There is an enigmatic force in Chaco Canyon – compelling and real. You can breathe it in. I have spent days and days in Chaco – looking, walking, longing, being, dreaming of a past – but not without a heavy dose of reality about how harsh the environment likely was in the past. Congested. Smokey. Barren. Denuded of anything indigenously green for fuel, tools or art. Persistence. What they couldn’t find in the valley, they brought in – sometimes from hundreds of miles away. Judging by the evidence of artifacts, pottery, tools, architecture and remnants the culture left behind, the harshness of the canyon ecosystems spawned inventive survival. Despite it’s past and all of the conjecture about how and why it “failed,” like all cultures eventually – the place is power. No doubt. Sounding clichéd and romantic? I don’t care. It is a “power place” on the most essential and deepest levels. People all over the planet occupy, at one time or another, places similar to Chaco Canyon. Places with unique geology that can sustain life – even if it is only for a few centuries. They are drawn to them. They are a locus. Why? Returning from Chaco I looked over the watercolors in my studio, thinking – I wish I could have tarried on for days and days painting there to see how far I would have taken them. It's one thing to pull out the watercolors back in the work place and attempt to paint more based on what I did on-site, from memory and the photographs - but in this case I'm fairly certain the real magic happens when you're on location. Looking and seeing in the moment. Go back and do more. Push it even further. With every visit I have made to Chaco Canyon a unique exchange occurs while I am there - a discourse – with the land, the collective memories unearthed in the dust and dirt as I wander, the antiquity, the moment, the monument – and the people that accompany me. This trip was no exception. The forcefully creative individuals who went along on this trip expanded the experience logarithmically and I thank them all infinitely for the connections, the new history, the shared and unique visions and the extraordinarily great time. I leave a bit of my soul every time I'm in Chaco Canyon, but I also take something unmistakable back with me. Indelible. Always. The photographs were all taken by Lawrence Fodor with a Canon 5D Mark III and an iPh0ne 6. All words and images are copyright © 2015 Lawrence Fodor and may not be reproduced of copied without the written consent of the artist. 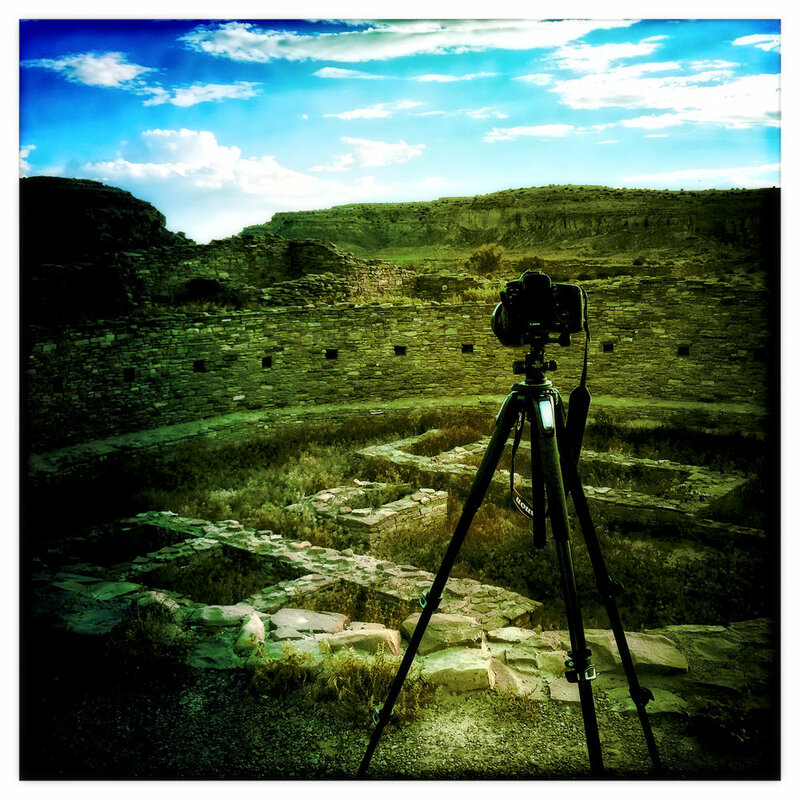 Chaco Canyon: wandering the past in the present - photographs and an essay by Lawrence Fodor. Lawrence Fodor recounts his camping, hiking and creative journey to Chaco Culture National Historical Park in New Mexico with five other artists in May 2015. A descriptive and illustrated narrative that includes entries drawn from his journal, photographs he took and watercolors he painted on location in Chaco Canyon and the surrounding mesas. There is magic at work in Chaco Canyon. It is enigmatic, powerful and sustained. "With every visit I make to Chaco Canyon a unique exchange occurs while I am there – a discourse – with the land, the collective memories unearthed in the dust and dirt as I wander, the antiquity, the moment, the monument – and the people that accompany me. This trip was no exception."